Eleanor Wiley and Maggie Oman Shannon have taken an ancient practice and made it new. A String and a Prayer recounts the history and symbolism of prayer beads, teaches basic techniques for stringing beads and a host of other objects into prayer beads, and offers a variety of prayers and rituals to use those beads on a daily basis. Beads have appeared throughout history. Prayer beads are used in the spiritual practices of cultures as diverse as the African Masai, Native Americans, Greek and Russian Orthodoxy, as well as the religious rituals of Islam, Hinduism, Christianity, and Buddhism. But prayer is highly personal. By infusing prayer beads with personal associations, we can keep our spirituality fresh. The beads are a device to help build and rebuild meaningful ritual in our lives. With myriad ideas about what makes objects sacred and where to find sacred objects -- from the personal, perhaps beads from a grandmother's broken rosary, to the unusual, maybe seashells from far away found in a thrift store -- A String and a Prayer offers many suggestions for different ways that beads can be made and used, exploring the creative roles they can play in our relationships, ceremonies, and rituals. "You are the expert, trust yourself. Let the instructions be a guide to your own creativity," write the authors. 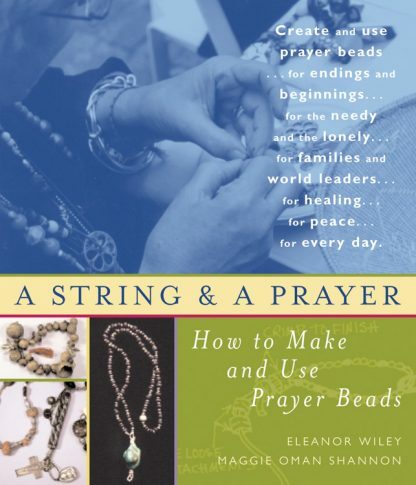 Eleanor Wiley is a former speech pathologist and gerontologist who began her prayer bead practice at age fifty-eight. She teaches workshops on making prayer beads as a spiritual practice all over the world; her pieces have been worn by Ram Dass and His Holiness the Dalai Lama. She is the author of A String and a Prayer. Her own spiritual practice includes beading, sitting meditation with both Christian and Buddhist communities, and practicing yoga and the Twelve Steps. Wiley's prayer beads are available through her website.